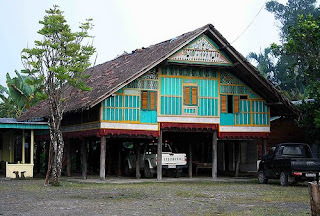 Deli’s house is one of the traditional houses from Deli – Sumatra – Indonesia. The model itself varies and depends on the tribes that is part of Deli area – North Sumatra. Actually the types also similar with many melayu models of Malay, because this is still from one rumpun. This one is model from some that working in Europe, but he want his house have their own local traditional model. Indonesia have many other traditional house name and model, but the different of every house model usually just at the house cup or top model, the other such as material, interior almost similar.